Tartan is the typical pattern of woven wool from Scottish Highlands and a traditional symbol of Scotland. Consisting of criss-crossed horizontal and vertical bands in multiple colors, tartan is often called plaid in USA. In the Victorian and Edwardian eras, tartan shifted from being just for men's clothing and become a part of women's fashion. By then, it has made reappearances in the world of fashion several times. In the late 1970s, punk fashion started an unorthodox use of tartan, worn unconventionally, as the expression of discontent against modern society and an anti-establishment symbol. Today tartan pattern is no longer limited to textiles, but is used on non-woven mediums, such as paper, plastics, packaging, and wall coverings. 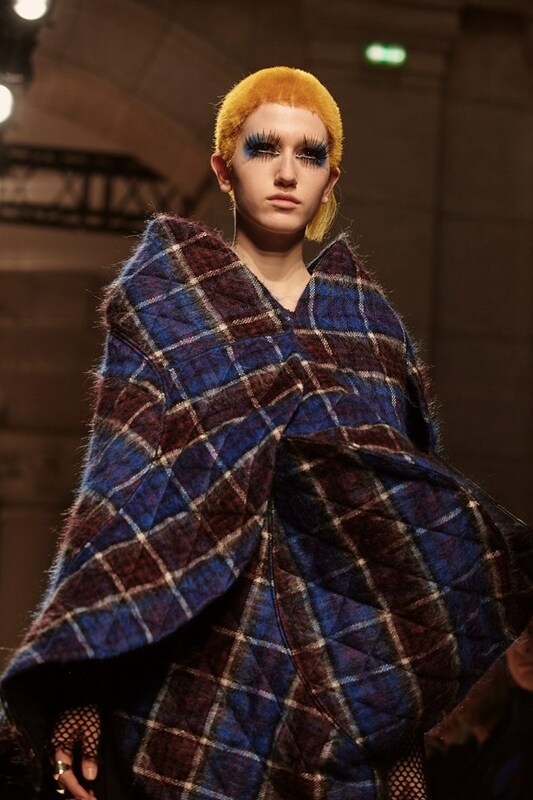 In AW17 show, Junya Watanabe reconfigure punk Tartan from '70s in unusual patchworks of different patterns, black leather and leopard skin.